I’m salivating. Mexico has done it to me again. Taunting, teasing and tantalizing me with new, and delicious foodie experiences. I’ve recently returned from a trip to the Yucatan region of Mexico and my thoughts are focused in only one direction. How do I get my hands on a scrumptious Mexican spice dip I tasted during a visit to a beautiful, private little hacienda in Yucatan? Let me give you a little back-story to this dilemma. Last week I was fortunate enough to go on a four-day trip to Mexico, where I explored the Mayan ruins of the Yucatan with two Maya archeologists from Catherwood Travels.The Catherwood Group also owns Rancho Xocempich, a hacienda with its very own cenote near Chichen Itza, a welcome rest stop after a hot sunny day exploring the history and sites of ancient Maya. The rough entrance to the property hid the delights awaiting us. A narrow winding road led to a hacienda restored to glowing cream-colored perfection. Lunch was served within minutes of our arrival, starting with vegetables and the spice dip. I loved it. Maybe it made a big impression on me because I was starving after a long morning at Chichen Itza, maybe it was because I love spice, the hotter the better, or perhaps just because it was a wonderfully delicious complement to sliced papaya, carrots, peppers, and oranges. During the next few days in Mexico I kept an eagle eye out in markets and small stores to see if I could buy some of this spice to bring home. I couldn’t find it anywhere, but I have to admit I was too busy touring, exploring and having fun to look very hard. But now I’m home and OMG, I want this spice dip. Thank goodness for Google, the source of all answers and most dilemmas. On the first page of my internet search for chili, lime, sugar, salt, I found the recipe for this magically delicious spice on the Spicy Perspective website but with no name attached to the spice mix. Does anyone know what the heck this concoction is called? If you do, be sure to fill us in via the comment section below. Mix the above ingredients with a mortar and pestle or in a small food processor. Serve with fresh fruit and vegetables (papaya, mango, oranges, carrots) as well as fresh lime wedges to squeeze over fruits, and vegetable. 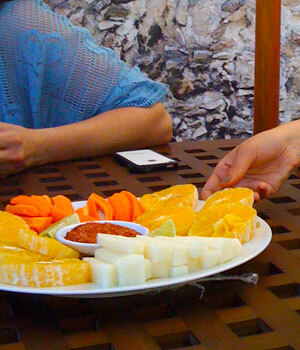 Dip fruit, vegetable slices in the Mexican spice mix, and enjoy! My favourite is this mixture on fresh pineapple, such a great combination of spicy and sweet. I have to admit, I’ll eat the food there, but I’m not into cooking it back home. All the more reason to keep travelling, I guess. Oh, I love spice though. We had a similar spice mixture with fresh pineapple in Thailand that we still make at home, with sugar, salt, and cayenne. The lime zest and ancho chili powder sound like excellent additions! One of my favorite souvenirs from a long-ago trip to the Yucatan were the several packets of different spice blends that we brought home from the market in Chetumal. They’re long gone, but the delicious memory remains.